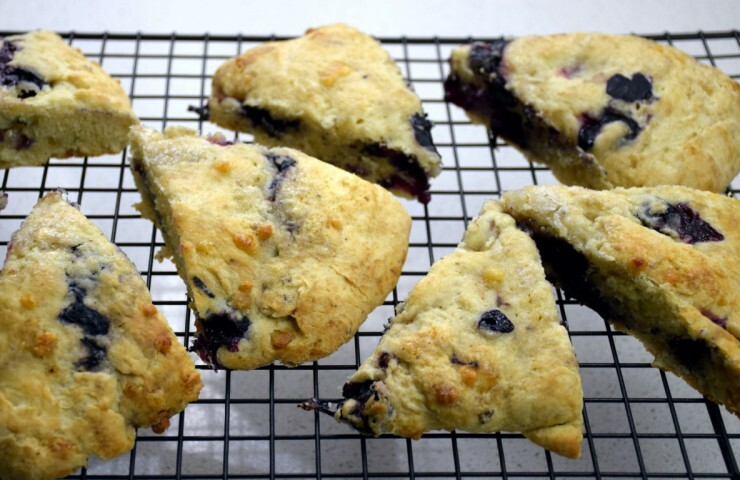 Scones are one of my favorite treats to enjoy with a great cup of coffee. I like that they are not too sweet and there are many variations to enjoy. 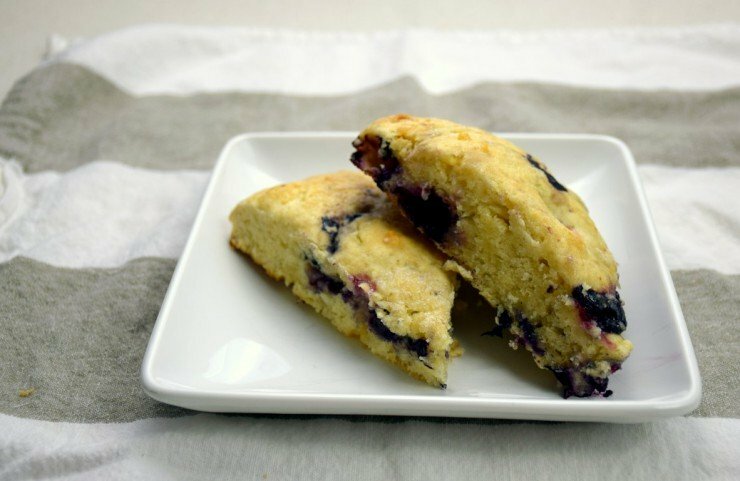 I love to make pumpkin scones with cinnamon chips, especially in the fall, but this recipe for blueberry white chocolate scones is one of my favorite go-to recipes. I first discovered this recipe on Kraft’s website, and after trying them out for a girl’s get-together, I decided it was a keeper. I’ve modified the recipe slightly by reducing the sugar content and increasing the amount blueberries. I also decided to use white chocolate chips instead of chopped up squares; one less step saves a little time! Anytime we have guests in town or I need to bake something quick for a get-together, I pull out this recipe and indulge in a delicious treat. In a large bowl, combine flour, 1/2 cup sugar, baking powder, and salt. Then cut in cold butter. If you need some guidance, this article does a great job of explaining the different methods you can use to cut in butter. I often use my food processor, but if I’m in a hurry, I tend to just use my hands. Once you have a coarse, crumb-like mixture, stir in 3/4 cup milk and the egg. Mix until just combined. Stir in white chocolate chips, then carefully fold in blueberries. Divide the dough into two balls, then transfer to a lightly floured surface. Carefully form each ball of dough into a round, about 1 inch thick. Transfer each round to an ungreased cookie sheet. I use two cookie sheets and place one round on each. Use a serrated knife to cut most of the way through each round into 8 wedges. Use a basting/pastry brush to brush 1 tablespoon of milk onto each round. Sprinkle each round with 1/2 tablespoon of sugar. Bake for 25 minutes, until the scones are lightly browned. If you want to bake all of the scones at the same time and your oven isn’t big enough to fit two cookie sheets side by side (like mine), place one sheet on the upper rack and one on the lower rack. Halfway through the baking time, quickly switch the cookie sheets to the opposite rack. After enjoying a scone (or two! 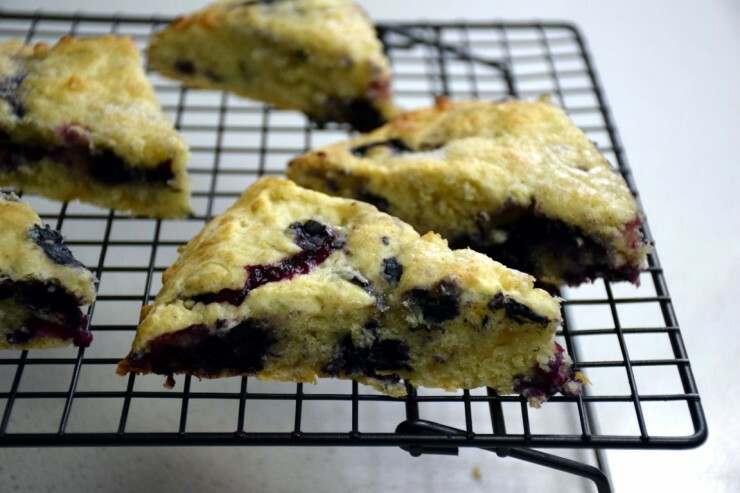 ), transfer the remaining scones to a cooling rack to cool. Store in an airtight container in the fridge for up to one week. In a large bowl, combine flour, 1/2 cup sugar, baking powder, and salt. Cut in cold butter using a pastry blender, two knives, a food processor, or your hands. Once you have a coarse, crumb-like mixture, stir in 3/4 cup milk and the egg. Mix until just combined. Stir in white chocolate chips, then fold in blueberries. Divide the dough into two balls, then transfer to a lightly floured surface. Carefully form each ball of dough into a round, about 1 inch thick. Transfer each round to an ungreased cookie sheet. Bake for 25 minutes, until the scones are lightly browned. Use the serrated knife to cut through the wedges of scones. Serve immediately, or transfer to a cooling rack to cool before storing in an airtight container.